Synthestech offers “cold transmutation” alchemy on the blockchain. Plus UFOs. The Bitcoin bubble is deflating, and there aren’t nearly enough suckers desperate to put their money into anything with the word “crypto” attached. Yep — it’s an ICO for alchemy. 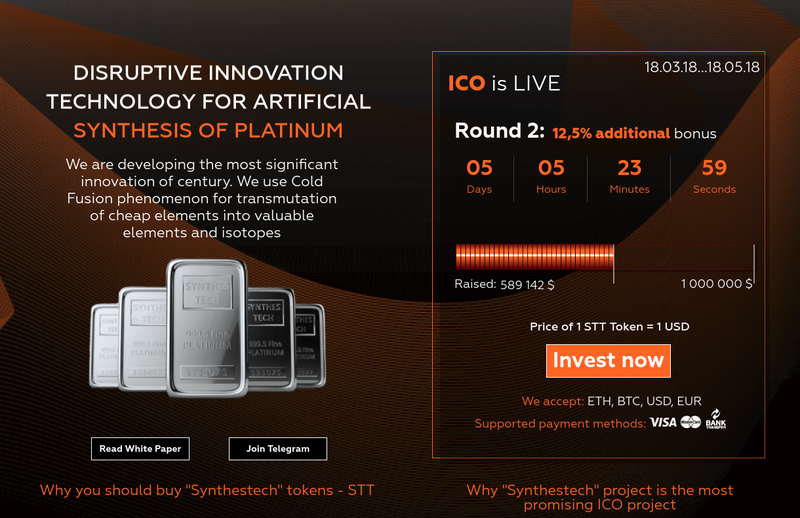 Synthestech are a Russian cold fusion startup, offering “COLD TRANSMUTATION OF CHEMICAL ELEMENTS: Technology for synthesis of precious metals.” They were founded in September 2017. The creator of the company is Vladislav Karabanov. He is a real person and there is news of him attending to congresses and about Synthestech existing, so you can be sure that this company is not a scam (or, at least, it exists). We have also found weird information about Vladislav Karabanov. A person also called Vladislav Karabanov has appeared on RT, a Russian TV network, claiming to have seen UFOs. He looks a lot like the pictures on the Synthestech sites, so we say it is probably the same person. Also, there is news about his company in a UFO’s site. Yeah, he seems to be a sketchy character. Vladislav says he might have already been in touch with visitors from outer space. “If I’m not being mistaken, the mere possibility of seeing and filming these objects, the way they appear, and move, and finding where their portals are is considered by ufologists to be second-degree contact,” he says. To get feedback from other UFO hunters, Vladislav has set up a website. He is certain that the area around his home and the summit of Bytkha Mountain in Sochi is being used by extraterrestrials as some sort of a gateway between worlds. Vladislav says for centuries this area was considered sacred by the local tribes. “The Ubykhs believed that mount Bythkha is a holy place, so they’ve built a sanctuary here. There seems to be some kind of different energy that can be felt, and it’s something that you cannot feel anywhere else,” the man explains. Cold fusion is the fusion of small atomic nuclei into larger ones, without the heat of a star or a hydrogen bomb. It has the minor problems that it doesn’t work — it contradicts vast quantities of extremely successful and well-tested theory, and the claimed successes can’t be reproduced. The term was popularised with the work of Stanley Pons and Martin Fleischmann, who ran an experiment in 1989 that seemed to generate anomalous amounts of heat just from chemical reactions. This got tremendous publicity … but no other laboratory could reproduce it. The banner was enthusiastically taken up by cranks, who follow in the footsteps of Pons and Fleischmann by publishing reams of further experiments that can’t be reproduced. They tend to euphemise it as Low-Energy Nuclear Reactions (“LENR”). The worst claims include blatant fraud such as Andrea Rossi’s Energy Catalyzer. Cranks also believe there is a massive conspiracy to suppress the truth about cold fusion. Can you turn lead into gold? Sure you can! You put it into a particle accelerator, and you fire subatomic particles at it until you knock three protons off. Or fill it with neutrons until it turns radioactive and decays into gold. This costs vastly more than the difference in price between lead and gold. Also, you’ll do much better starting with mercury. Also, the gold will probably be radioactive. But never say no! 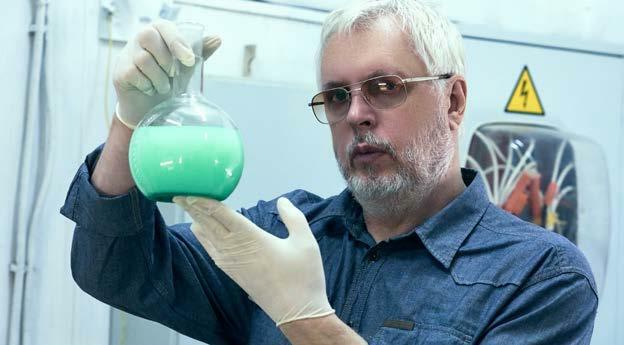 Synthestech claim to have experimental results showing that transmutation of elements at low temperatures — and without a particle accelerator — is not only possible, but economically feasible, using bacteria to do the magic bit. We have achieved phenomenal results in numerous experiments. In a matrix consisting of low-value elements such as iron, copper, tungsten, etc., as a result of processing, emerged new elements — the valuable ones among them were platinum, iridium, ruthenium, etc. In other words, artificial production of valuable chemical elements of the platinum group has been carried out. The full white paper is substantially a detailed history of fabulously exciting, but irreproducible, scientific results in cold fusion and cold transmutation technology. The invention relates to the field of biotechnology and chemical transmutation. Radioactive feedstock containing radioactive chemical elements or isotopes, treated with an aqueous suspension of bacteria of the genus Thiobacillus, in the presence of variable valence elements. As with KrioRus’ cryonics ICO CryoGen, Synthestech are seeking funding to try to develop their pseudoscience that can’t possibly work. STT is a standard Ethereum ERC-20 token. Investors will share in a pool of 36% of the profits from Synthestech’s commercialisation of its technology. The project Synthestech was launched exclusively with the commercial world in mind. So scientific theories were initially left aside. 1. STT Tokens emission is aimed at creating real material values — precious metals, which will always be valued. While program codes might become useless, when better codes emerge. STT will give the right to receive profit from innovative technology that is unrivaled now and will remain so in the near future. 2. The STT token price, as the project progresses and capitalization increases, will grow tens and maybe hundreds of times. 3. The basis of the STT project and its revenues is the unique know-how and innovative technology known to a narrow circle of people. This is complicated knowledge that takes a long time to implement. Perhaps tens of years. This technology will permanently yield income. At the same time, cryptocurrencies and cryptocurrency projects are also innovative, but many intelligent programmers create a lot of competing programs. This is marketed explicitly as an investment — you put in money, they build a lab, you get returns. Synthestech also tout the medical benefits of their work — platinum has medical applications. The project roadmap posits commercial Cold Transmutation technology by October 2019, with investors seeing dividends from January 2020. The “press coverage” linked at the bottom of the ICO front page is entirely their own paid press releases and advertisements. This ICO, that is selling literally impossible magic beans, had a successful pre-ICO sale of $300,000, and is currently into its main sale. Synthestech publicly posted a bounty of STT tokens for anyone who joined in the publicity push, listing various promotional venues and what you’d get for promotion in each of them. That post is a good worked example of ICO promotion in practice. This is the ICO space, so openly paid shilling is perfectly normal. ICObench: 3.6 — a number calculated by “Benchy,” their ICO analyzer bot. If you want to invest in this company, we urge you not to. Unless you really have strong reasons to believe that this cold transmutation process is actually true, chances are that you are being fooled or that you are believing in a madman. Alchemy. Turns your gold into theirs. Thanks to Magrov on SomethingAwful for spotting this one. This important work was publicised in far superior venues, such as the article “Russian Scientists Produce A SHOCKING Technology That Can Transmute Any Element Into Another!” that I link in the post, which I found in the Journal of Life Coach Code, linked from the article “Russian Scientists Just Revealed The Most Powerful Discovery In The History Of Mankind” in the Journal of Awareness Act. I look forward to his full experimental protocol writeup in viXra. Tim Starling reminds me that instead of bacteria to do the transmutation, maybe they could try goose liver. Stupidity is the world’s most powerful renewable resource. I look forward to this collector’s item of an ICO ending up in court: how do you think the cross-examination will proceed? Cold transmutation technology is here. An Idaho company has a general process for transmuting metals from a common mineral . No magic, no ufos, no bacteria, just advanced chemistry, aided by the fact that the atomic theory does not do a good job of describing sub molecular structure, so don’t use it for research. Or hire a chemist and send him. Science isn’t done by NDA, so amazingly enough I don’t believe you. 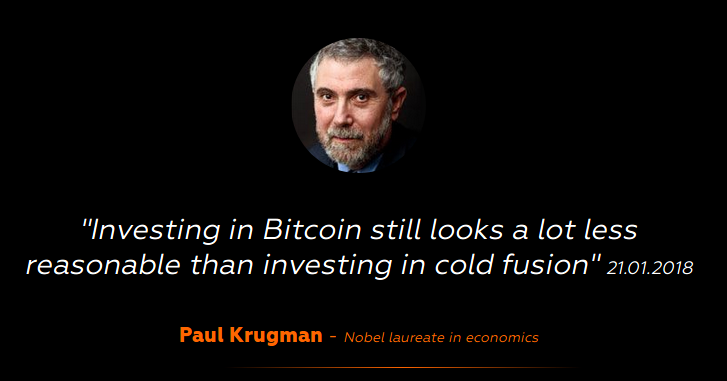 If you were an investor, what proof would satisfy you? For a start, an explanation of your science that convinces mainstream scientists and not just your fellow cold fusion advocates. Because for your claims to be true, large swathes of physics would have to be thrown out. Basically, your curious lack of Nobels were your claims to be true is a problem. David—-It is almost like you are saying my process must conform to conventional science–and that is more important than repeatability. There was never any possibility of me publishing this. I am an independent researcher without a PhD and the claim_ “We convert road gravel into gold?” Nobody wants to touch this. We negotiated with a Chemist from Boise State University—-(better known for its football team than its chemistry department.) He initially agreed to repeat the basic experiment, then when I told him how, he panicked and said there was no way he was going to put his name and BSU on this, even if it it did work. Not much of a scientist, in my opinion, worrying about his reputation more than the truth. We are currently trying to hire a chemist to repeat the process, a PhD from the local college. Hiring someone sort of compromises the integrity of the process, don’t you think? If you are interested I could give you a description of the science used—–but I warn you, I begin by throwing out the atomic theory. I’m really not interested, but thanks anyway.